So where does this leave good ol' Barry boy? Well, blogging, naturally. 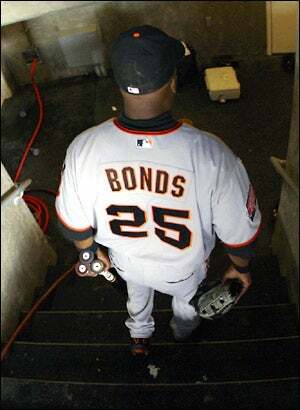 Bonds, via his website: "There is more baseball in me and I plan on continuing my career. My quest for a World Series ring continues." Yup. Look out American League, here he comes! • Boston Breathes. Josh Beckett pitched six strong innings to become the first 20-game winner in the majors since '05, as the Sox snapped a four-game losing streak in an 8-1 win over the Rays. Meanwhile, the Yankees rallied to send the game to extra innings by scoring four runs in the ninth off Jays ace Doc Halladay, but lost it in the 14th on a home run by Toronto catcher Gregg Zaun. (Silently pumps fist.) The BoSox have a 2 1/2 game lead in the East. • Rising Arizona. Tony Clark had three hits and drove in four, leading the D-Backs to a 12-3 rout over the Dodgers. The win, coupled with the Padres 14-inning loss to the Rockies, pushes Arizona up to a 1 1/2 game lead in the NL West. Math is fun. • The More Games Played, The More Things Stay The Same. The Mets and Phillies won to keep the margin in the NL East at 1 1/2 games. Same situation in the NL Central, where the first-place Cubs and second-place Brewers both were Victorious B.I.G.